The case of missing medicine  Ukraine's humanitarian aid tax? The story as it was told to H. Krill by Lisa Prytula. In an email circulated on October 5, 2005, Lisa Prytula - a registered nurse who had just returned from a volunteer medical mission in Ukraine - complained about the unwarranted confiscation of medicines by customs officials at Boryspil Airport in Kyiv. The medications were to have been used primarily to treat children and the elderly of Zhytomyr Oblast. 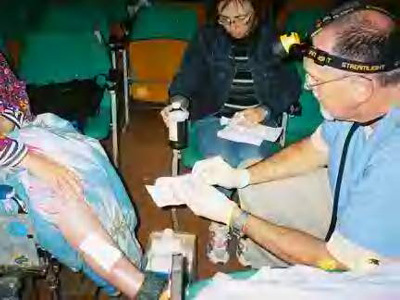 Ms. Prytula was one of a team of seven doctors and nurses sponsored by the non-profit organization Volunteers in Medical Missions (VIMM), a 501c3 organization based in South Carolina, to travel to Ukraine in September, 2005. 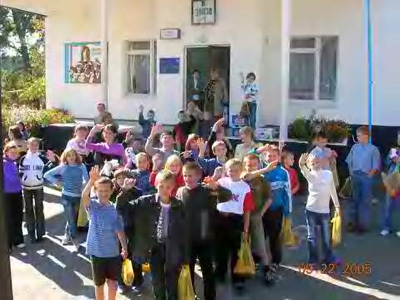 This was the VIMM's sixth humanitarian aid mission to Ukraine, but it was the first time that the organization encountered problems passing through customs. "I have learned much about the corruption that prevents the delivery of charitable health care," said Ms. Prytula, who is convinced that the confiscation was not so much a matter of border regulations as an attempt by Ukrainian customs officials to extort a sizeable bribe. 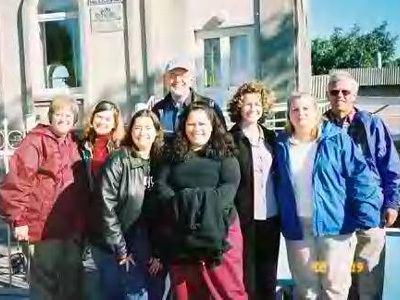 Volunteers in Medical Missions Ukraine team 2005 led by Dr. Carl Jones III (standing rear, baseball cap) & Lisa Prytula, RN (next to Dr. Jones, black jacket, white shirt). VIMM has been sending volunteer aid to various countries around the world for nearly 20 years. Leading the VIMM team to Ukraine was Dr. Carl Jones, III, of South Carolina. This was the second medical aid trip to Ukraine for Lisa Prytula, who hails from St. Paul, Minnesota. Arrangements for the team's room and board as well as transportation had been made in advance with their liaison, Father Sasha Kravchenko, who heads the Baptist church in Zhytomyr. On the ground, plans were laid for the volunteer team to set up clinics in the villages of Sadove, Korestisiv, Berezhivka, Kamyanka, and others. According to Dr. Jones, they planned to hold eight clinics but were only able to hold them on six days in orphanages and schools. Most of those requiring treatment are children and the elderly. Diabetes, osteoporosis and joint diseases are encountered frequently among the latter, while child care generally involves ear infections, parasitic diseases, etc. VIMM even hands out eyeglasses and provides dental care if a dentist is among the team of volunteers (not on this trip). The medical team arrived in Kyiv's Boryspil Airport via Lufthansa Airlines on Sunday, September 18. Each of the seven team members was transporting extra bags and packages containing clothing for themselves, some gifts for the needy, and an assortment of medical supplies that included medicines, dressings, bandages, stethoscopes, blood glucose meters, eyeglasses, and even toys for children. Ms. Prytula paid for her own 8 pieces of excess baggage when boarding in the U.S.
Children of Sadove village waiting outside the VIMM clinic. Kyiv's Boryspil Airport is not equipped with luggage carts, making the transfer from the pick-up area over to customs cumbersome given the volume of packages brought by the VIMM team. Noting the large number of suitcases and plastic containers (for the medicines) - carefully labeled with large orange stickers indicating that this was a volunteer medical mission - the group was soon approached by a customs agent. All of the paperwork was in order - or so they thought. The Letter of Invitation explaining their mission was in hand, and they had a complete inventory of all the medical supplies and medicines. At first, the customs officer seemed to be rushing them through, almost as if his intention was to move the team out of the airport without anyone else noticing. But the sheer number of packages apparently raised a red flag for the customs official, and that's where VIMM's troubles began. The only one in the group to speak Ukrainian (none of the doctors or nurses spoke Russian), Ms. Prytula acted as both the team translator and spokesperson. Unable to satisfy all of the questions that the customs official was asking, they were permitted to call in their host, Fr. Sasha Kravchenko, who was waiting at the gate. But rather than serving to expedite the process, this led to a grueling 3 hours of negotiations between the team, their sponsor, and a parade of customs officials that according to Ms. Prytula became increasingly aggressive in their behavior as the time passed. Dr. Carl Jones III debrides wound (removes dead tissue). The container of medicines presented the chief obstacle. One customs official informed the VIMM team that they must pay a "tariff" of 45% of the value of the medicine. The list of medications valued at a total of US$3,000 was among the customs declarations held by Dr. Jones. At 45%, this would have meant a tax of US$1350, a substantial sum of money given that many of the medicines had been donated to VIMM free of charge. Some had been purchased and donated by the team members themselves. Nevertheless, dissatisfied with the paltry tax on US$3000, the customs officials claimed that the estimate was far too low and proceeded to arbitrarily revalue the entire inventory. Apparently, Boryspil's customs officers - trained to catch smugglers and other evil doers from absconding with the nation's wealth - are also experts at pricing pharmaceuticals, because they soon arrived at a staggering US$118,000 as the "actual" value of the plastic container's contents. A truly remarkable feat considering that they never even opened the container of medicine. At the stated rate of 45%, the "tariff" would amount to US$53,100! The team might have entertained the idea of paying off a smaller sum just to get past the unpleasant incident and get started on their mission, but the demand for a payment of US$53,000 was too absurd. The team protested at the unreasonably high figure, insisting that "we don't have that kind of money." The stunning response from one of the customs officers - "Yes, you do - you're American doctors." Further complaints about this unfair treatment were met with comments such as, "You don't understand how things work in our country" and "You Americans really like Yushchenko. You like him more than we do." One official was overheard to say "Yushchenko might have won the election, but we're going to win the war." Evidently, the team was being compelled to pay a political tax in addition to the tariff on the medicine. The reportedly pervasive corruption that holds Ukraine in its grip was being unmistakably demonstrated to the VIMM team. 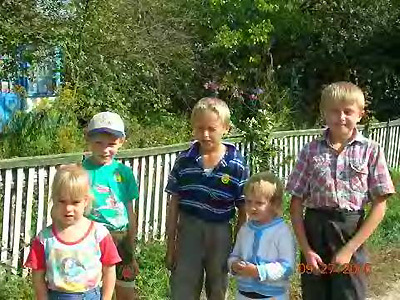 Orphanage in Berezivka for deaf children ages 3-18. Keeping one's composure was becoming increasingly difficult, said Ms. Prytula. By now at least a half dozen customs agents had marched through the room where they were being held. It was a room "somewhere in the back," and although the door remained open, "it was very intimidating," said Ms. Prytula. The same questions were being asked over and over by different officers, and with each official that entered, the tone seemed to get more aggressive than the one before. Outside the room, the officers snickered to each other between taking turns to badger the group. The sense that the group was "being mocked by the customs officials" was palpable. Even though Ms. Prytula had made it clear that she only understood Ukrainian, several of the officers addressed them only in Russian. The VIMM team became ever more agitated and fearful of how the situation would play out in the end. Eventually, one of the officers pulled some "unofficial looking" papers out of a drawer. "They looked old," said Ms. Prytula, who was told to sign them even though she had no idea was written on them - they were printed in Russian. Finally, as the "tariff" was unpaid, the team was told by yet another official who claimed she was in charge that they could either board a return flight with all of their belongings, or they could enter the country - but without the medicines. These would be held in customs for a period of up to 10 days, as they had to be approved by the Ministry of Health. According to this officer, they could either get the container back, pending approval by the Ministry of Health, or it could be picked up again whenever the team departed Ukraine. The group agreed to leave the medicine in the custody of the customs officials and proceed with their mission. Ms. Prytula was given two telephone numbers to call to check on the status of the container of medications. The team proceeded to Zhytomyr with their host. In Zhytomyr, they purchased what medicines were available in local pharmacies to partly replenish the missing supply, a few of the team members contributing cash to the pool. "Actually," said Dr. Jones, "we held our first clinic with hardly any medications at all." Not willing to leave the matter unresolved, Ms. Prytula turned to the Children of Chornobyl Fund (CCRF), a U.S-based NGO with an office in Kyiv and years of experience with medical missions of its own. CCRF's Chairman, Dr. Zenon Matkiwsky, and Alex Kuzma, Executive Director, interceded by phoning the Ministry of Health. According to Mr. Kuzma, they spoke "to the assistant to the assistant Minister of Health", who at that time was the Acting Minister  the government had been sacked earlier that month, but most of the ministers had been asked to stay on while the new government was being formed. CCRF followed up with a letter on VIMM's behalf, requesting that the shipment be released to the medical team. The assistant to the assistant Acting Minister of Health assured CCRF that a letter releasing the medications had been sent to the Boryspil customs office, but subsequent calls to Boryspil by Mr. Kuzma and Ms. Prytula proved fruitless  Customs denied ever receiving a written release from the Ministry. The VIMM team completed its mission as well as possible under the circumstances, and returned to the U.S. on October 1. The team chose not to try and retrieve the medicine on the return leg of the trip due to the potential for tampering after the container had been taken into the custody of the customs officials. As of today, the fate of the container is unknown, but concerns about the missing cache of medicine remain. If, for example, the contents of the plastic container were to be sold on the black market, would the medicines be properly dispensed? Ms. Prytula would like to see the government of Ukraine open an investigation into this matter. She said that identifying some of the airport customs agents was not a problem - they were the same ones that passed the medical mission through with no snags the year before. Would she ever go on another medical mission to Ukraine? "Yes, of course," said Ms. Prytula, but she would have to obtain iron-clad assurances from the Ukrainian government that "we would not be harassed as we were this time, and that our supplies would not be confiscated." According to Ms. Prytula, one of VIMM's board members pointed out that the organization's humanitarian aid missions had faced many challenges around the world, but never before have their provisions been confiscated  other countries welcome the aid they offer. "This experience took a lot out of me emotionally," said Dr. Jones, "but I feel saddest because of the friends I have made on the five mission trips I've made to Zhytomyr. The renewal of these friendships each year was the one greatest attraction that drew me back to Ukraine year after year since 2000." Dr. Jones "will not be coming back to Ukraine." NOTE: Brama.com spoke with Registered Nurse Lisa Prytula in order to clarify a few points in her original email dated October 5, 2005. What emerged from our conversation was a much more insidious tale that would make any philanthropic organization think twice about send assistance to Ukraine. One Ukrainian diplomat has suggested that the border regulations are in place to protect Ukraine's citizens, and that VIMM may not have had the proper paperwork to document its medical mission. This is a valid point, and should be taken into consideration. Unfortunately, there is no simple way to find out what Ukraine's regulations are for transporting medications across its borders. In addition, VIMM has conducted medical missions to Ukraine in the past but never encountered resistance at the border checkpoint before. But whether this is a case of a lack of documentation (possible) or a misunderstanding on the part of the customs agents (debatable), it is the arbitrary and intimidating methodology employed by the customs officials that should be under question. From what Lisa Prytula described, it would appear that bribery was the intention, and failing that, withholding the cache of medications was either the punishment or a motive for profit. Ukraine should open an investigation to determine exactly what transpired in this case. It should take appropriate action to prevent abuse of its laws by its own citizens, train its customs officers in dealing with unusual situations, and at the same time enable humanitarian aid missions to operate within the scope of Ukrainian law. Complete, easy to access information, and transparency are key in precluding confusion, misunderstandings, and most of all, corruption.